Are Dividend-Paying Stocks a “Good Alternative” to Bonds? The Wharton School of the University of Pennsylvania, which serves as UPenn’s business school, was founded in 1881. Through its online business journal, known as Knowledge@Wharton, the school shares a variety of insights through interviews, analysis and research, book reviews, and more. In a recent article, “When Dividends Pay Dividends – and When They Don’t,” Knowledge@Wharton shared some of Jeremy Siegel’s thoughts on dividend investing. While sharing those thoughts, Siegel, perhaps best known for his book, “Stocks for the Long Run,” also revealed his current feelings toward bonds. First, I would like to remind Siegel that not every investor is able to live off the income provided by his or her investment portfolio. Perhaps this will come as a shock to those dividend-infatuated, overweight-equities-until-I-die type of investors, but there are actually some people who will have to slowly liquidate their portfolios in order to make it through retirement. And tens of millions of those people are getting very close to retirement. Advocating a policy of liquidating fixed-income holdings in order to buy individual stocks, simply on the notion that they pay “generous” dividends and have “relatively low” (debatable, by the way) P/Es is advice that could end up being a death knell for the portfolios of many investors nearing retirement. I realize that multi-year bull markets tend to increase complacency among market pundits. But I hope that individual investors who read things such as the aforementioned quote don’t also become overly complacent. Price-to-earnings ratios, as a standalone metric, mean nothing. And a seemingly “generous” dividend, even when combined with a supposed low P/E ratio, is not in itself a reason to sell bonds and buy stocks. With all this in mind, I would like to ask the first of three questions to Jeremy Siegel: Let’s consider investors who will be retiring over the next few years, who will need to slowly draw down their portfolios over the course of their retirements, who are generally risk-averse, and whose portfolios cannot afford even one more equity bear market. Is now really the best time for those investors to liquidate a portion of their fixed-income holdings to move into stocks? It is true that if yields rise, certain bond fund investors are at risk of never seeing their initial investment return to its cost basis. In other words, the investment could permanently suffer mark-to-market losses. This can pose a problem for investors who will need to draw down their portfolios in retirement. But a more complete picture of the risks to fixed income investors would note that individual-bond investors are immune to the risk of loss of principal, as long as the issuer doesn’t default. And with prudent financial planning, even investors who will need to draw down their portfolios during retirement could still hold their bonds to maturity, thereby avoiding having to take mark-to-market losses on individual bonds that will mature at par. Additionally, the idea that interest rates “are so low they can’t fall further, and a rise is much more likely” includes an inaccuracy and an abundance of pure speculation. First, it is not true that interest rates cannot fall further. As we have seen in certain European countries, interest rates can actually go negative. Even in Japan, a country whose leaders are promising to print as much money as it takes to fight inflation, interest rates continue to go lower. The 10-year Japanese government bond was recently yielding 0.56%. This compares to a 1.82% yield on the 10-year U.S. Treasury. The Japanese 30-year government bond is yielding 1.52%. A 30-year U.S. Treasury bond was recently yielding 3.06%. In fact, under the right conditions, it is possible for yields to go much lower. My second (two-part) question for Jeremey Siegel is: How do you explain the recent Japanese bond market experience of falling yields in spite of a government’s promising to bring about inflation and what exactly will bring about, in the United States, the “much more likely” rise in yield that Knowledge@Wharton indicates in the article? This leads me to my third and final question for Jeremy Siegel: When adjusting the S&P 500’s current payout ratio for profits generated overseas, would you still be as bullish on the potential for dividend growth as you are today? If you are a fixed-income investor who is contemplating liquidating a portion of your bond portfolio in order to buy stocks with that money, please be sure to consider more than a stock’s P/E ratio and current dividend-yield in your research. 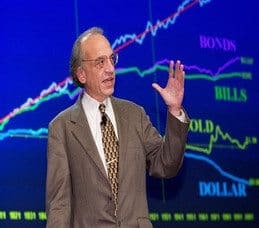 Additionally, if you will need to draw down your investment portfolio in order to live during retirement, be sure you fully understand the consequences to your portfolio of following Jeremy Siegel’s advice of using dividend-paying stocks as an alternative to a portion of your fixed-income holdings. I realize that in the world of “Stocks for the Long Run,” the sun may always shine brightly upon the bottom of a company’s capital structure. In the real world, that may not always be the case. Can you afford the risk of allocating more to stocks than you typically have in the past? Carefully consider the answer to this question before blindly trimming fixed-income allocations and chasing after dividend-paying stocks. We see a lot of people buying INTC for the divided as “a way to park some cash” in this low rate environment. In the last 6 months, INTC has had 8 days where the price has dropped more than 2% and 3 days where it dropped more than 3%. If those happen to be days you need to raise cash, there goes the better part of a year’s dividend (wait, you say you didn’t own it for a year? OK, you lost MORE than the dividend). And that’s not a knock on INTC: many “high” dividend-paying stocks exhibit this sort of daily volatility. Whether the rate environment is 1% or 5%, bonds are still bonds and equities never are.